Hi Michelle! I just finished up your budget class in October, and am loving being able to take the reins with the household budget. 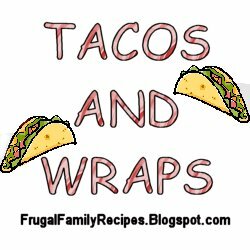 I just made this meal for dinner tonight, and I figured it might be a great one for your frugal family meals blog. Growing up in Southern California, you learn that everything can be turned into a taco! And fish tacos are especially delicious... but fresh fish, mango salsa, and avocados can be pricey. 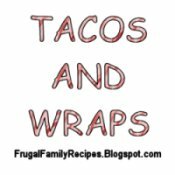 Here's my frugal fish taco recipe... it has the added benefit of being super-easy and quick. Hope everyone likes it! Cook the fish sticks in the oven according to directions. Cut the cabbage up into slivers (like you are making coleslaw). Heat up the tortillas in the oven or microwave. To assemble the tacos: lay down a tortilla, top with 4 fish sticks in the middle (two across, two down). Place a handful of shredded cabbage on top. Then drizzle with ranch dressing. We usually have this dish with Spanish rice and black beans. You can add cheese, salsa or any other topping you wish!